Donetsk - France coach Laurent Blanc praised his side's character after Les Bleus fought back to claim a deserved share of the spoils against England with a 1-1 draw here Monday in their opening Euro 2012 Group D clash. France were rocked after Joleon Lescott headed England into the lead after 30 minutes in the Donbass Arena but responded well to claim a draw thanks to Samir Nasri's 39th-minute strike. The French, who extended their unbeaten run to 22 games following the draw, eventually went on to dominate their technically inferior opponents but were unable to pierce a dogged English defence. However Blanc was pleased at the way his side had recovered after a slow start which ended with Lescott's opener. 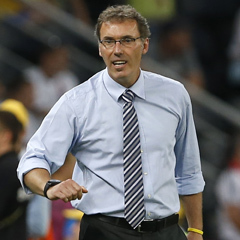 "I think we took a while to get in the game and as is often the way we got punished," Blanc said. "But that helped us get in the game finally ironically. "The fact that it was very hot didn't make it easy for the side that was attacking more and I think France attacked a lot more than England tonight. "We're not entirely thrilled, but we're not entirely disappointed either. But I think we need to be realistic after the way we played in the first 20 minutes. "We could have lost this game had we not reacted, so that's one of the positives. But I think if you look at the game the side that played the most football was France." Blanc meanwhile praised the goalscoring contribution of Nasri, who has had a fractious relationship with the French coach in the past. "Samir has always been there with the other talented players," he said. "But you need to be a little bit more patient with them than other players. "Because if they share your opinion or your philosophy they're going to give you the right response on the pitch and he did that this evening."